At a time when astronomers are building billion-dollar telescopes with mirrors 30 meters across, the 1.4-meter instrument being installed this month atop South Baldy Mountain in New Mexico may seem like a bit player. This month, a dome will be slipped over the first of 10 1.4-meter telescopes in an optical interferometer. 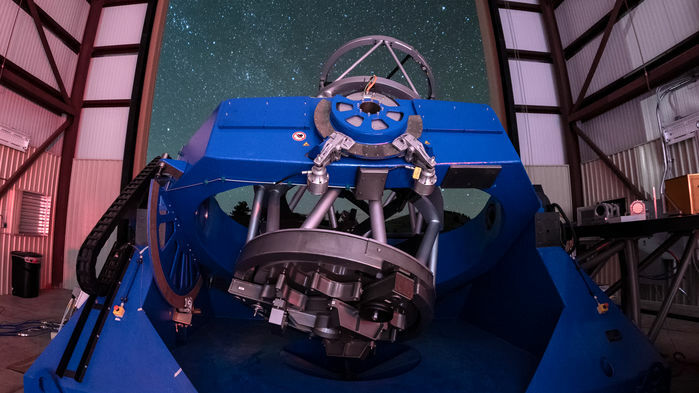 At a time when astronomers are building billion-dollar telescopes with mirrors 30 meters across, the 1.4-meter instrument being installed this month atop South Baldy Mountain in New Mexico may seem like a bit player. But over the next few years, nine more identical telescopes will join it on the grassy, 3200-meter summit, forming a Y-shaped array that will surpass any other optical telescope in its eye for detail. When it's complete around 2025, the $200 million Magdalena Ridge Observatory Interferometer (MROI) will have the equivalent resolution of a gigantic telescope 347 meters across. MROI's small telescopes can't match the light-gathering power of its giant cousins, so it will be limited to bright targets. But by combining light from the spread-out telescopes, it is expected to make out small structures on stellar surfaces, image dust around newborn stars, and peer at supermassive black holes at the center of some galaxies. It will even be able to make out details as small as a centimeter across on satellites in geosynchronous orbit, 36,000 kilometers above Earth, enabling it to spy on spy satellites. 288/5000 "We know very little about the organism," says Norris. Being able to work long in a bowl can lead to better treatment for millions of people infected worldwide and open the way to developing a vaccine to prevent sexually transmitted diseases (SN: 11/26/16, p.5). ..
That's one reason why the U.S. Air Force, which wants to monitor its own orbital assets and presumably those of others, is funding MROI. "They want to know: Did the boom break or did some part of the photovoltaic panels collapse?" says Michelle Creech-Eakman, an astronomer at the New Mexico Institute of Mining and Technology in Socorro and project scientist on MROI. But if the facility succeeds, its biggest impact could be on the field of astronomy, by drawing new attention to the promise of optical interferometry, a powerful but challenging strategy for extracting exquisitely sharp images from relatively small, cheap telescopes.